I'm troubleshooting a dead Apple IIe enhanced, and I'm having trouble finding documentation on testing the 65C02 (as opposed to the 6502). Specifically, I've found using a logic probe that pin 6 (NMI, active low) is not connected. It seems like that should be high during normal operation. I've been meaning to get around to this for ages, sorry. Tonight I stumbled across SAMS COMPUTERFACTS for the Apple IIe which I had downloaded from the Internet Archive. Here is the logic chart data for the CPU (IC UC4) from page 27. I've rearranged it for clarity. 65C02 is a CMOS version of 6502 (which was NMOS) chip. Judging from Wikipedia articles on these chips and few of the datasheets I found, it seems like it should work exactly the same way it did on 6502, i.e. held high during normal operation, pulled low to fire an interrupt. Who made your 65C02? Was it WDC? If it's WDC, then there are a few pins that should be held high with a 3.3k pull-up resistor. Such as the BE pin which is only on WDC versions. BE (Bus Enable) should be pulled up. With WDC's 65c02, leave it unconnected. With anyone else's, ground it. ...pull this up to +5V through a 3.3K resistor. You'll only find this pin on WDC's 65c02's anyway, not on those of other manufacturers. Point is, 65C02 isn't always just a drop-in replacement. You need to make sure all of the pins are grounded, pulled-up (or down), etc. I don't have the A2 schematics in front of me...but make sure that all of the pins are taken care of even if there isn't a card in the system. Also, this is another good reference on IRQ/NMI of the 65C02. I highly recommend reading the entire "primer". Not the answer you're looking for? 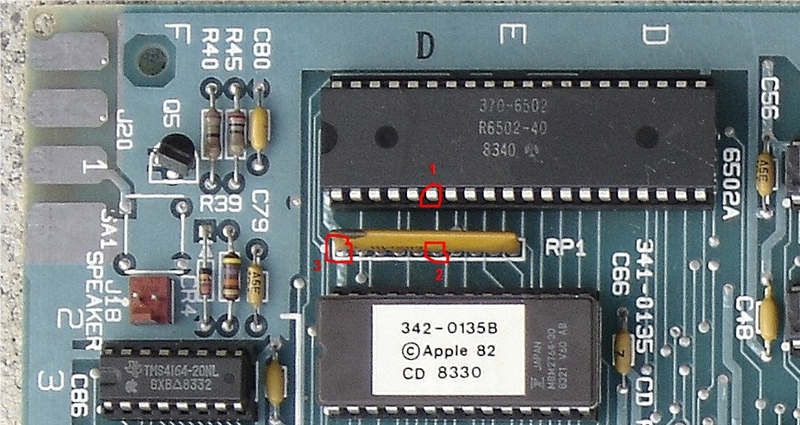 Browse other questions tagged apple-ii apple 6502 65c02 or ask your own question. What Apple computers are shown in this MacBook Pro Reveal video?